Healthy fried food isn't a contradiction. To keep foods from soaking up oil, fry according to recipe instructions. For most foods, 375°F is optimal. (CookingLight.com) -- Some nutrition myths bounce around on crazy e-mail chain letters and pop up on goofy evening news reports. Others fuel the sale of rip-off diet books. Some are so accepted they seem hardwired into our brains. Take deep-fried foods, for example. They're universally bad for you, right? Well, no. When we challenged ourselves to explore whether fried foods could be made healthy, we discovered that, when done properly, fried foods don't have to be forever banished from a healthy diet. The exercise inspired us to take on some other ingrained nutrition misconceptions. We talked with leading nutrition researchers, chefs, and food scientists and did some sleuthing of our own to debunk 10 myths so you can enjoy many once-forbidden foods without that old familiar twinge of guilt. Truth: Use the sweet stuff to ensure that sugar calories are far from "empty" calories. Sugar is essential in the kitchen. 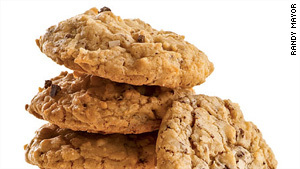 Consider all that it does for baking, creating a tender cake crumb and ensuring crisp cookies. Then there's its role in creating airy meringue or soft-textured ice cream. Keep in mind that other sweeteners like "natural" honey are basically refined sugar anyway and they are all metabolized by your body the same way, as 4 calories per gram. Sugar also balances the flavors in healthy foods that might not taste so great on their own. Don't go overboard, of course. Most health experts suggest that added sugar supply no more than 10 percent of your total calories -- about 200 in a 2,000-calorie diet. Good news: A little sugar can go a long way. Adding a wee bit of sugar to balance a too-tart tomato sauce is a good thing; so is a teaspoon of honey on a tart grapefruit half or in plain yogurt. "Add a little bit of sugar to help boost your intake of nutrient-rich foods by making them tastier," says Jackie Newgent, author of the All-Natural Diabetes Cookbook. In this refreshing palate cleansing sorbet, sugar tames the tartness of grapefruit juice. And with just two ingredients, it could not be simpler to prepare. A serving delivers about two-thirds of your RDA for vitamin C, and only 145 calories. Myth 2. Eating eggs raises your cholesterol levels. 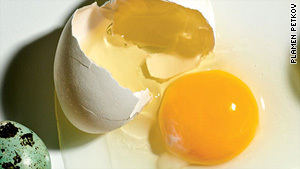 Truth: Dietary cholesterol found in eggs has little to do with the amount of cholesterol in your body. The confusion can be boiled down to semantics: The same word, "cholesterol," is used to describe two different things. Dietary cholesterol the fat-like molecules in animal-based foods like eggs doesn't greatly affect the amount of cholesterol circulating in your bloodstream. Your body makes its own cholesterol, so it doesn't need much of the kind you eat. Instead, what fuels your body's cholesterol-making machine is certain saturated and trans fats. Eggs contain relatively small amounts of saturated fat. One large egg contains about 1.5 grams saturated fat, a fraction of the amount in the tablespoon of butter many cooks use to cook that egg in. So, cutting eggs out of your diet is a bad idea; they're a rich source of 13 vitamins and minerals. Good news: Eggs of all kinds are fine. The kind of cholesterol found in eggs doesn't affect the cholesterol in your blood, so go ahead and enjoy eggs for breakfast, lunch, or dinner, guilt-free. In healthy people, "the research with eggs has never shown any link of egg consumption with blood lipids or with risk of heart disease," says Don Layman, professor emeritus in the Department of Food Science and Human Nutrition at the University of Illinois at Urbana-Champaign. Make this Mexican scrambled egg dish for dinner, brunch, or for a hearty breakfast. Leave all the seeds in the jalapeño if you want a spicier kick, adjust the hot pepper sauce to taste, and throw in your favorite add-ins to create a satisfying meal for four. Myth 3: All saturated fats raise blood cholesterol. Truth: New research shows that some saturated fats don't. Just when we'd all gotten comfortable with the idea that there are good-for-you mono- and polyunsaturated fats (like those found in olive oil and walnuts), along comes new research calling into question the one principle most health professionals thought was sacrosanct: All saturated fat is bad. Researchers have long known that there are many kinds of saturated fats, and they are handled differently by the body when consumed. Stearic acid, a type of saturated fat found naturally in cocoa, dairy products, meats, and poultry, as well as palm and coconut oils, does not raise harmful LDL cholesterol but boosts beneficial HDL cholesterol levels. Good news: Saturated fat may be better than once thought. 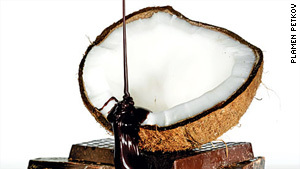 Eating foods like coconut and chocolate that contain stearic acid, an HDL-cholesterol booster that may eventually be called the "good" saturated fat, is healthier than once thought. This is not a license to eat freely of anything containing stearic acid, though, because foods rich in any type of fat tend to be dense in calories, as well. Given that both chocolate and coconut are not as "bad" as once thought, and given that they taste mighty good together, we baked up a batch of toasty, chocolaty treats to celebrate. Like all sweets with few other nutrients, though, they are treats perfectly healthy every once in a while. Myth 4: The only heart-friendly alcohol is red wine. Truth: Beer, wine, and liquors all confer the same health benefits. The so-called French Paradox elevated red wine to health-food status when researchers thought it was the antioxidants in the drink that protected the foie gras- and cheese-loving French from heart disease. More recent research, however, has shown that antioxidants aren't the answer after all. 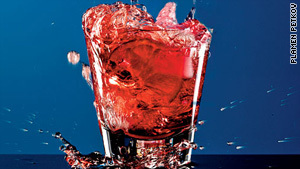 Alcohol, the ethanol itself, raises levels of protective HDL, or good cholesterol, which help protect against plaque buildup in the arteries and reduce clotting factors that contribute to heart attack and stroke, according to Eric Rimm, associate professor of nutrition at the School of Public Health at Harvard University. Any kind of beverage that contains alcohol, when consumed in moderation (and that means one to two drinks a day), helps reduce heart disease risk. Myth 5: Adding salt to the pot adds sodium to the food. Truth: Salt added to boiling water may actually make vegetables more nutritious. Public health messages encouraging us to shake our salt-in-everything habits are, in general, good; sodium is a potential problem even for non-hypertensive people. But it's easy to overlook how sodium can actually help in recipes. "Salt in the cooking water reduces the leaching of nutrients from vegetables into the water," says Harold McGee, author of On Food & Cooking. That means your blanched broccoli, green beans, or asparagus likely retains more nutrients. "It also speeds up the cooking process so you don't lose as many nutrients from overcooking." McGee recommends using about 1 teaspoon of salt per cup of water. The amount of sodium absorbed by the food is minuscule. Myth 6: Fried foods are always too fatty. 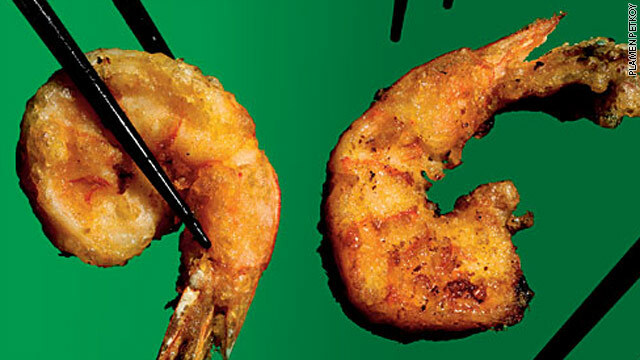 Truth: Healthy deep-fried food is not an oxymoron. Here's how frying works: When food is exposed to hot oil, the moisture inside boils and pushes to the surface and then out into the oil. As moisture leaves, it creates a barrier, minimizing oil absorption when the frying is done right. Meanwhile, the little oil that does penetrate the food's surface forms a crisp, tasty crust. To keep foods from soaking up oil, fry according to recipe instructions. For most foods, 375°F is optimal. Oil temperatures that are too low will increase fat absorption. When we added tempura-coated vegetables to cooler-than-optimal oil, the result was greasy and inedible -- they absorbed more than 1 cup of oil instead of 1/3 cup. So, watch the oil temperature like a hawk using a candy/fry thermometer, and drain cooked foods on a paper towel for a minute or two before diving in. Good news: You can have fried catfish and hush puppies, too. Keep in mind that we're not giving fast-food fried chicken dinners with French fries a passing grade. Such a meal contains an entire day's worth of calories and sodium, thanks to large portion sizes, excessive breading, and globs of sauces. 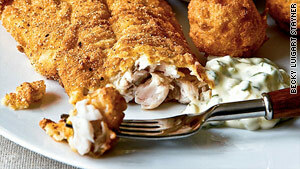 But as an occasional treat, home-fried foods have a place in a healthy diet. Use in moderation by pairing with a sensible side or salad. Always choose a healthy oil that's low in saturated fat -- such as peanut, soybean, and canola oils -- and follow our step-by-step techniques to frying basics to keep calories and fat as low as possible. In the hands of a careful home cook, a delicately breaded and fried catfish fillet with a few hush puppies can be a perfectly reasonable and delicious dinner. Myth 7: The more fiber you eat, the better. Truth: Not all fibers are equally beneficial. Consider the source. Yogurt doesn't naturally come with fiber, yet the grocery aisles now boast fiber-supplemented yogurt, along with cereals, energy bars, even water. What's the deal? Fiber is a fad-food component right now, and manufacturers are isolating specific types of fiber and adding them to packaged foods to take advantage. But the science isn't entirely clear yet: Just as we're learning more about different types of fat, research is showing how complex fiber is as well. We now know that different fibers have different functions (wheat bran helps move foods along; oat bran lowers cholesterol; inulin supports healthy gut bacteria). Some experts are skeptical that the so-called faux-fiber foods offer the same beneficial effect as naturally fiber-rich ones like whole grains, vegetables, fruits, and legumes. Good news: Fiber-rich whole foods satisfy hunger. While it's true that only half of us eat the fiber we need for good health, eating processed foods with added fiber doesn't get us off the hook. Fact is, most processed foods lack a bevy of vitamins, minerals, and phytonutrients. 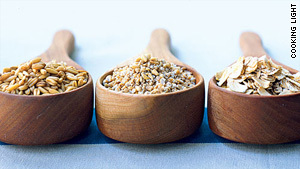 Eating fiber-rich whole foods is the best way to gain this essential component of you diet. 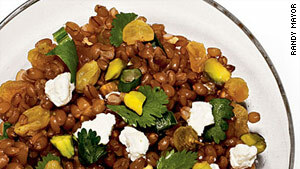 In this recipe, whole-grain wheat berries are chewy, mild, and packed with fiber. Dressing the hot wheat berries in a homemade spicy-sweet vinaigrette and letting stand for 20 minutes infuses them with intense flavor. And more good news: This fiber- and protein-rich salad will curb hunger pains, something packaged foods can't always deliver on. Myth 8: You should always remove chicken skin before eating. Truth: You can enjoy a skin-on chicken breast without blowing your sat-fat budget. 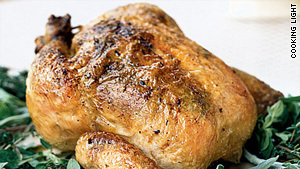 Half the pleasure of eating roast chicken comes from the gloriously crisp, brown skin that seems to melt in your mouth. Yet the skinless, boneless chicken breast -- one of the more boring protein sources on Earth -- became the health-conscious cook's gold standard somewhere along the way. Fortunately, the long-standing command to strip poultry of its skin before eating doesn't hold up under a nutritional microscope. A 12-ounce bone-in, skin-on chicken breast half contains just 2.5 grams of saturated fat and 50 calories more than its similarly portioned skinless counterpart. Good news: You can splurge with skin-on chicken from time to time. A chicken breast will always be lean -- skinned or not. What's more, 55 percent of the fat in the chicken skin is monounsaturated -- the heart-healthy kind you want more of, says Amy Myrdal Miller, program director for Strategic Initiatives at The Culinary Institute of America at Greystone. So if you and your family are tired of plain skinless, boneless chicken breasts, splurge on a skin-on option like this oregano- and lime-scented dish. A quick pan sauce made from some of the delectable pan drippings will make your regular chicken dinner a lot more interesting and appetizing. 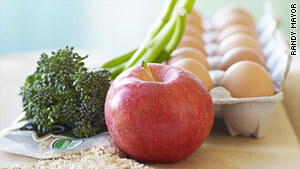 Myth 9: Organic foods are more nutritious than conventional. If you buy organic because you believe that sustainable farming supports the health of the soil, the work of small farmers, or the well-being of livestock, that's all good. And you may find it more tasty. However, it's not accurate to also promote organic as inherently more nutritious. Researchers at the London School of Hygiene & Tropical Medicine provided the most comprehensive review of organic foods to date. Their conclusion: No significant nutritional difference exists between conventional and organic crops and livestock. A good radish by any other name is still a radish. There is, of course, still the issue of trace amounts of pesticides or herbicides -- wash conventional produce carefully. Myth 10: Cooking olive oil destroys its health benefits. Truth: Even delicate extra-virgin oils can take the heat without sacrificing nutrition. This one has been kicking around ever since olive oil became a "good" fat: Cook with premium versions and you heat away the healthful properties. It simply isn't true. First of all, heart-healthy mono-unsaturated fats aren't unfavorably altered by heat. They survive a sauté intact. Now, research is showing that other plant-based compounds -- the elements that likely give olive oils their complex flavor profiles as well as other healthful properties -- can also stand up to standard cooking procedures. They're surprisingly stable, as long as the oil isn't heated past its smoking point, which for extra-virgin olive oil is pretty high, about 405°F. As long as oil is kept below its smoking point, flavor and nutrition are intact. More important is how you store the oil. Fats and phytonutrients stay stable for up to two years in unopened opaque bottles stored at room temperature and away from light. Heat, light, and air drastically affect stability. 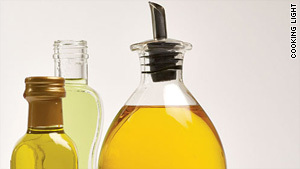 Store oil in a room-temp cupboard, and use within six months. In this simple side dish, extra-virgin olive oil adds great fruity flavor, and sautéing over high heat doesn't burn away the oil's healthful antioxidants.